It’s a tradition here that when you reach a milestone birthday you choose a race to reflect that, so when a 50km race popped onto my radar a week ahead of Steph’s birthday we signed up immediately. No, Steph isn’t turning 50 – we’re old school and work in miles, so you do the maths (and subtract to make an even number) – but we were in desperate need of a proper catch up – we haven’t seen in each other since I moved up to Edinburgh – so a run at party pace over a long weekend up North was put in the diary a good few months ago. On Saturday morning, bright and early, we drove from Edinburgh to Foxlake near Dunbar on the East coast, about a half hour drive, to park the car, register for the race, pick up numbers and then leave on a bus to the start line at Port Seton. 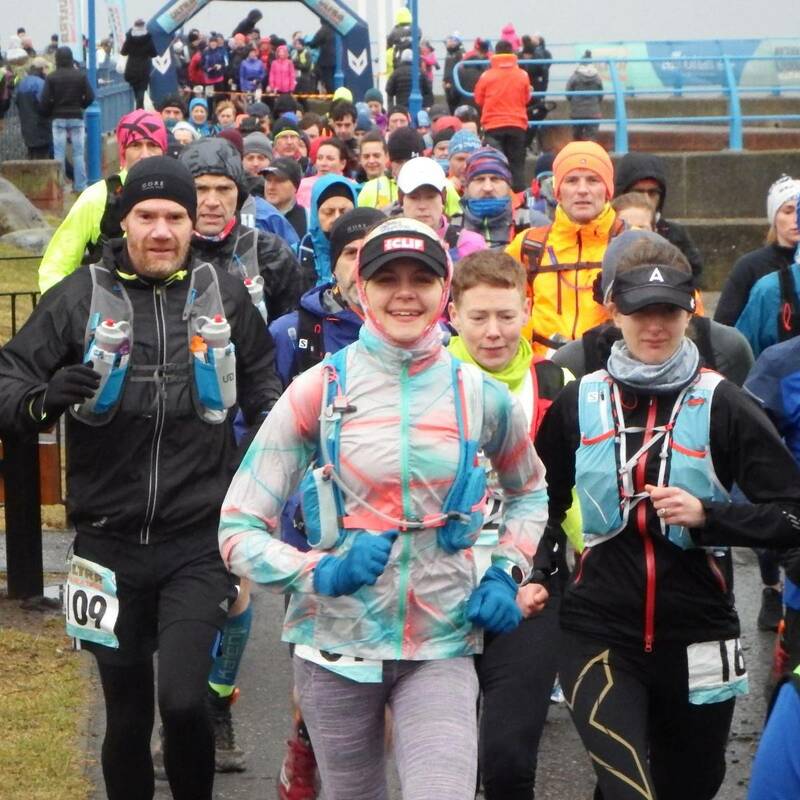 The route was an A to B along the coastline finishing at Foxlake and as well as solo runners there were teams also running it as a relay, 25km each. 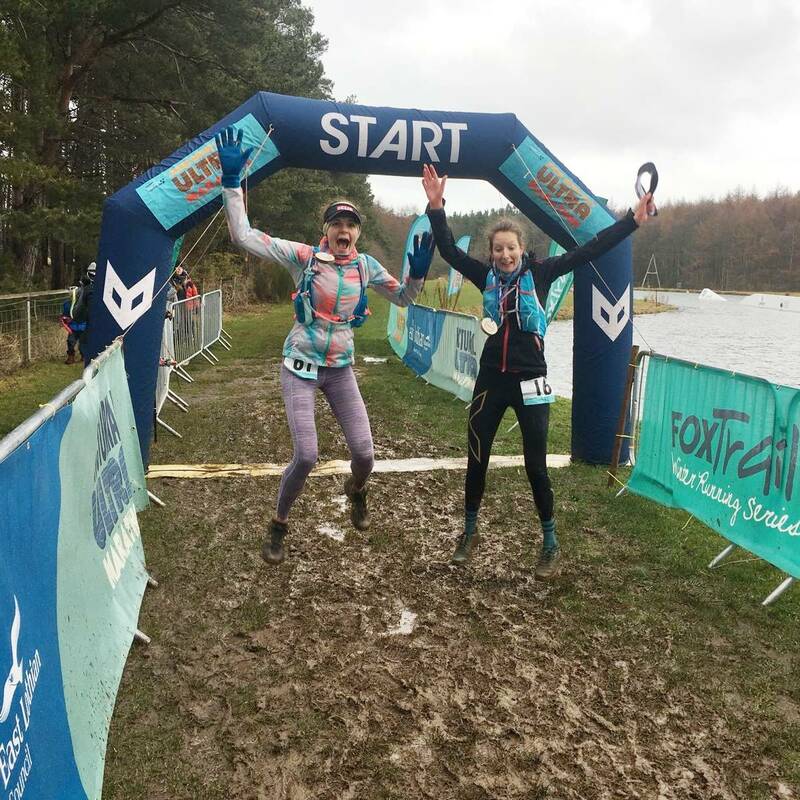 It was cold and wet when the buses full of runners arrived at the start line and as some queued for toilets others stayed inside the buses, keeping warm, stretching, eating and preparing for a long day out in the rain, sleet and wind that was forecast. I kept warm until the last few minutes, diving into the men’s loos before running to drop my bag and get to the start line. As Steph and I took selfies the keen runners were toeing the line eager to set off and to our surprise they were staggering the start so we missed the first wave completely! Not wanting to get cold and keen to chase others and get moving we weaved our way to the front and set off with the second group, heading East with the sea to our left. It would be like this for the first half, dipping in and out of the coastal trail, onto the sandy beach and around the villages of Aberlady, Gullane and Dirleton before the 25km mark at North Berwick. The first aid station was tucked into the grounds of the Archerfield estate at 9 miles/ 15km and here we saw my Mum and Dad supporting, but ran straight past the homemade chocolate brownies and offers of water and fruit, feeling it was a little too early to start fueling. Our plan was to snack at 10, 15, 20 and 25 miles in, and remind each other to do so, saving the best snacks until last. We were both also carrying water, Steph a 2l bladder in her Nathan pack and I had 2 500ml soft flasks in my Salomon 5l pack. As our soaking wet trail shoes hit the soft sand of the beach at North Berwick we crossed the half way mark, and as the relay runners handed over we made a pit stop at the lifeboat station, sipping long awaited flat coke and unwrapping our second snack bars. As we got going again, back along the sand for a short stretch and then up through the trails behind the town, Steph reminded me we were on the home straight – still a long way to go, but I remembered back to the recce we’d run a few weeks earlier – and that my Mum and Dad would be popping up again as support soon enough. At the bottom of North Berwick Law, we spotted them and after a quick chat and an update of the race going on at the front of the pack (including Nige and friends!) we were off, onwards. 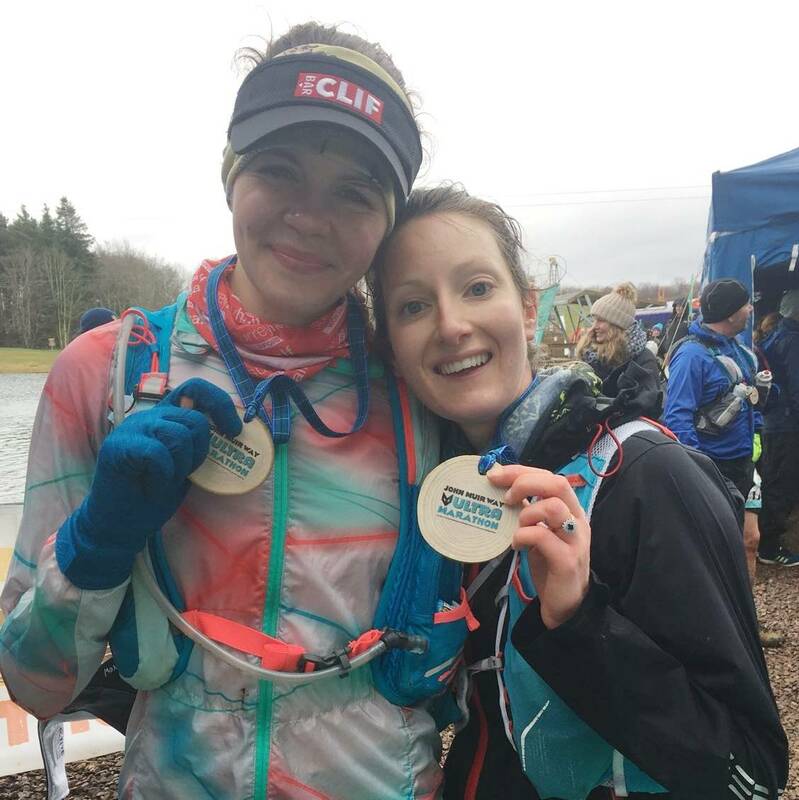 As expected after a week or two of miserable, wet Scottish weather and a snow melt, the forest loops between 30 and 35km were an absolute mudfest. No trail shoe could grip at anything below it so we were both slipping and sliding all over the place, dodging puddles and trying our best to avoid falling and covering ourselves in mud from head to toe. After another short pit stop and some easier country roads we found ourselves at 40k – 10k, 2 parkruns to go – and swerving the town of East Linton where Nige and I had made a U-turn on our recce. New territory meant fresh, unexplored trail, and I was grateful for the distraction as my knee had now started hurting and I thought I was probably starting to annoy Steph! 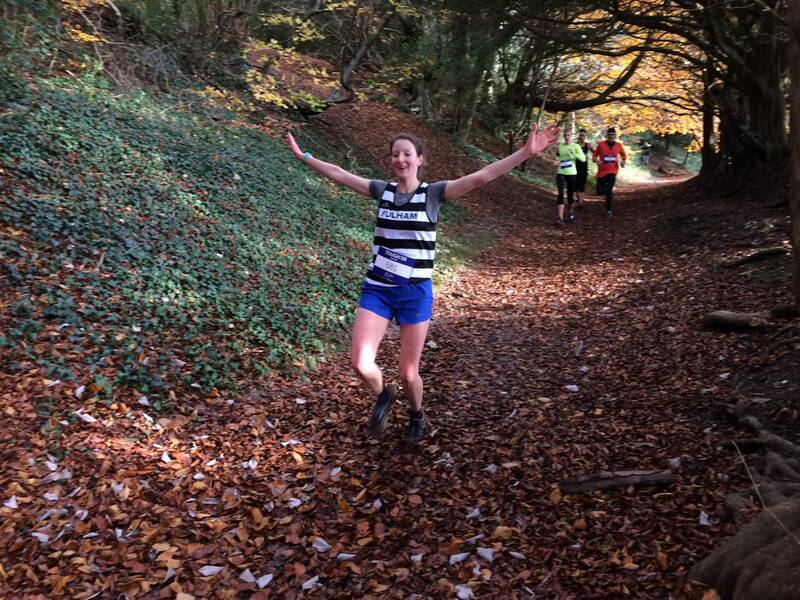 At 26 miles – I guess a nod to marathon distance – we found our last aid station, Mum and Dad again who cheered us on and said ‘see you at the finish line!’ and with 5 miles to go we ploughed on. The last few miles were a struggle. 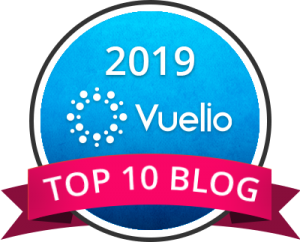 Our target time – although our aim was just to enjoy it at party pace and have a good ol’ catch up – was around the 5 hour mark and despite us both feeling well within that there we had no control over the battling headwind along the final stretch of coastline. We were exposed without shelter and even though we were counting down the kilometres they didn’t feel like they were ticking by quick enough. My knee was getting worse and I couldn’t move any quicker, but I couldn’t bring myself to walk, simply because the sooner we finished the sooner we would be out of this brutal Scottish weather, so Steph pulled me along and together we finally found shelter in the forest around Foxlake, less than a kilometre to go. 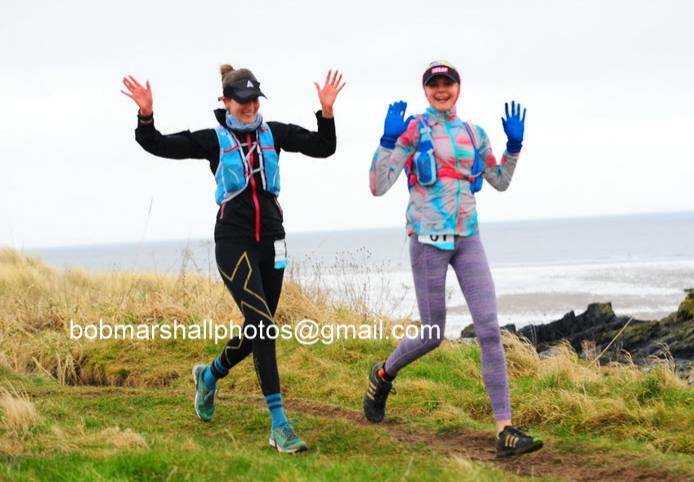 Our third 50km race together, finished as we always do, hand in hand. We were given our medals – but no water!? – and attempted our traditional jumping shot for the cameras, heaving ourselves up over the muddy finish line. We’d finished in time for the prize giving and were delighted to hear that Nige had taken 2nd place on the podium with good friend and team mate Matt in 3rd. Steph and I had clocked the exact same time of course, finishing joint 8th ladies in 5:07:22. 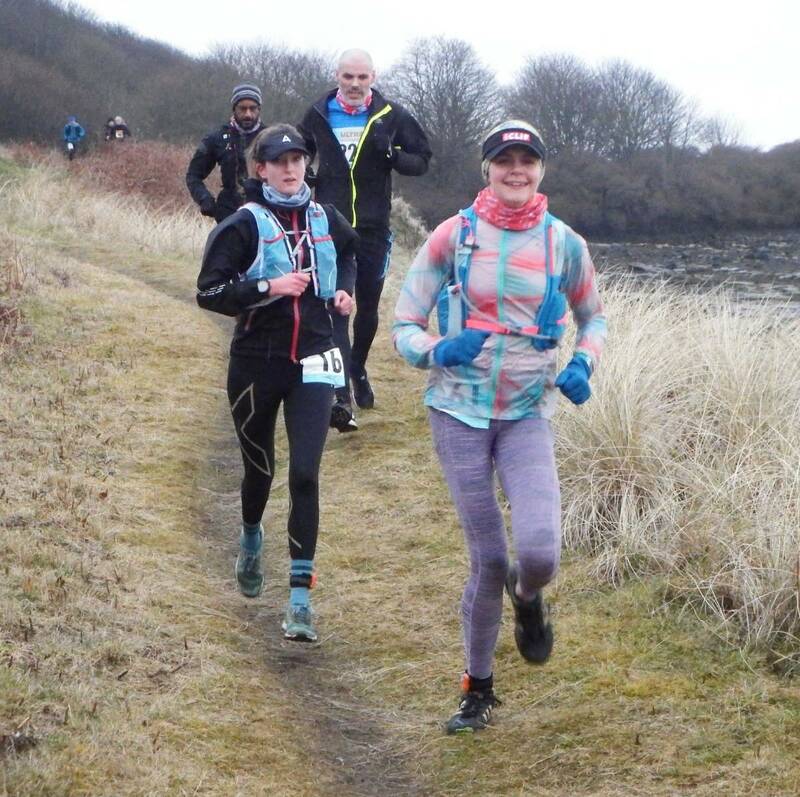 A superbly organised and well marshaled route along a beautiful trail, just a pity about the unpredictable Scottish weather (of course it was bright, sunny and dry the following day!) but not even a little sleet and snow can dampen the race high of another milestone birthday celebrated in the best way with my best people. Happy birthday Steph! Here’s to many more running and racing together! Previous Post I’m a Love Trails Festival Ambassador!